Arkansas has a very high population of premature infants, defined as being born at less than 37 weeks. Many of those are very low birth weight infants, or babies weighing less than 1,500 grams or three pounds and six ounces. The University of Arkansas for Medical Sciences (UAMS) Medical Center takes referrals for high risk deliveries from around the state. Each year of the approximately 3,000 babies born at UAMS, nearly 1,000 are admitted to the Special Care, Intensive Care, or Critical Care Nursery. The problem isn't unique to Arkansas. Nearly one in ten babies in the U.S. is born prematurely. The U.S. has one of the highest infant mortality rates (death in the first year of life) of any of the industrialized countries. More than one third of these deaths are related to prematurity. Neonatologist Whit Hall, MD, said UAMS is working with the March of Dimes to find the causes for prematurity, both in Arkansas and across the U.S.
"Teen pregnancy is a factor," Hall said. "And mothers over the age of 35 have a higher risk for pre-term deliveries. Race also plays a role. African Americans have a much higher rate of pre-term pregnancies than white or Hispanic mothers. We don't really know the reason for that. There are some studies that show genetics play a role, as well as stress." Studies have also shown preterm babies who are delivered in a hospital that has special perinatal services such as UAMS, do much better than if delivered in hospitals without such services. UAMS has a large referral practice because it has a perinatal unit staffed around-the-clock with neonatologists, as well maternal fetal medicine doctors who specialize in high-risk pregnancies. Hall attributes the high success rate in part to volume. 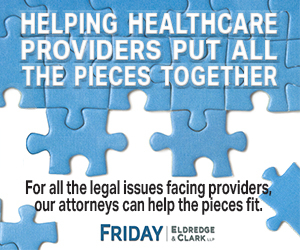 "Volume plays a big role in many things like surgical outcomes and complex medical problems," Hall said. "Studies have shown that if the volume is high, a patient will do better. We take care of the very low weight deliveries every other day. A hospital that does it once a month will not be as adept at caring for these preterm neonates. That is true all over the country. That doesn't mean they aren't good hospitals. But everyone around the country, including Arkansas, is trying to deliver premature babies where they can be best cared for." Hall said Baptist Health Medical Center in Little Rock has a unit similar to UAMS and also cares for a large number of small babies. Many other hospitals in Arkansas such as St Bernard's in Jonesboro also care for small babies - not babies as small as at UAMS and Baptist, but down to two pounds. "They do a good job," Hall said. Arkansas now has regionalization of neonatal intensive care. Hospitals with appropriate levels of care are listed on the Arkansas Department of Health website. "The biggest thing I've seen in my career as far as improving the outcomes for low birth weight babies is the regionalization of neonatal intensive care," Hall said. 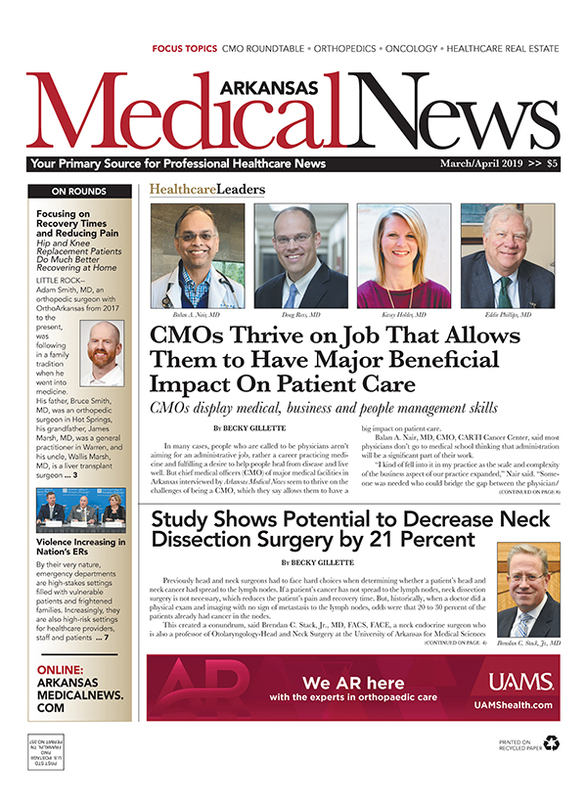 "That was an effort helped not only by UAMS, but also Baptist Medical Center, the Arkansas Department of Health, the March of Dimes, Arkansas Medicaid, the Arkansas Hospital Association and parents. All these organizations did the right thing. Additionally, telemedicine, which was funded by a grant from the National Institutes of Health through the Center for Translational Neuroscience, helped bring about this change. This initiative lowered infant mortality from 8.5 to 7 per 1,000 live births. "Regionalization of healthcare in Arkansas has saved about 60 babies a year who otherwise wouldn't have survived," Hall said. "In our state, regionalization is voluntary, but the hospitals and physicians have bought into this because the data show regionalization of care saves babies lives. It is all voluntary and it's working. That is a real tribute to the physicians and hospitals in Arkansas." Hall, who has been a neonatologist since 1993, said the biggest technology advance he has seen during his career has been the development and broad use of surfactant. That came into general use in 2000, and has saved a number of babies lives. "Surfactant is a chemical that treats premature babies' lungs, which is probably the main reason babies require intensive care," Hall said. "This was spearheaded by the NIH, and was spurred on by the loss of one of the Kennedy babies in the 1960s." Hall has had a bit of an unusual career path. He had 13 years of general pediatric practice in Little Rock before he went back for a neonatology fellowship in 1990. He was medical director of the UAMS Neonatology Intensive Care Unit from 1993 until this year - a total of 25 years. This year, he turned that duty over Sara Peeples, MD. That UAMS is now a Baby Friendly Hospital, one of only two in the state with that designation, a high accomplishment. Hall has been involved in the Helping Babies Breathe Program and has been to Africa twice to help under-resourced countries with neonatal resuscitations. He has also been heavily involved in two major research projects. 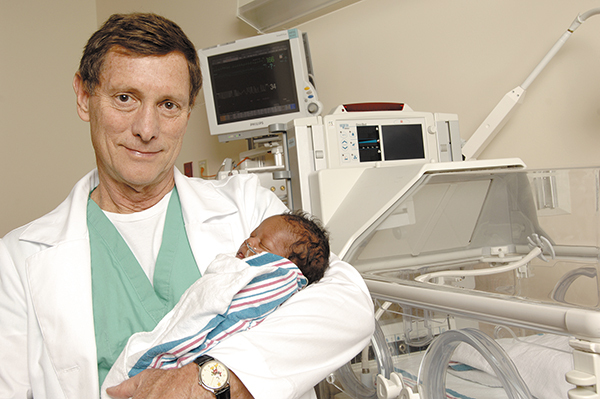 His group spearheaded a neonatal pain trial in 2000. And since 2007 he has also been involved with research into the use of telemedicine in lowering infant mortality. He is grateful for the funding provided by the NIH through the Center for Translational Neuroscience and his mentor, Edgar Garcia-Rill, PhD. 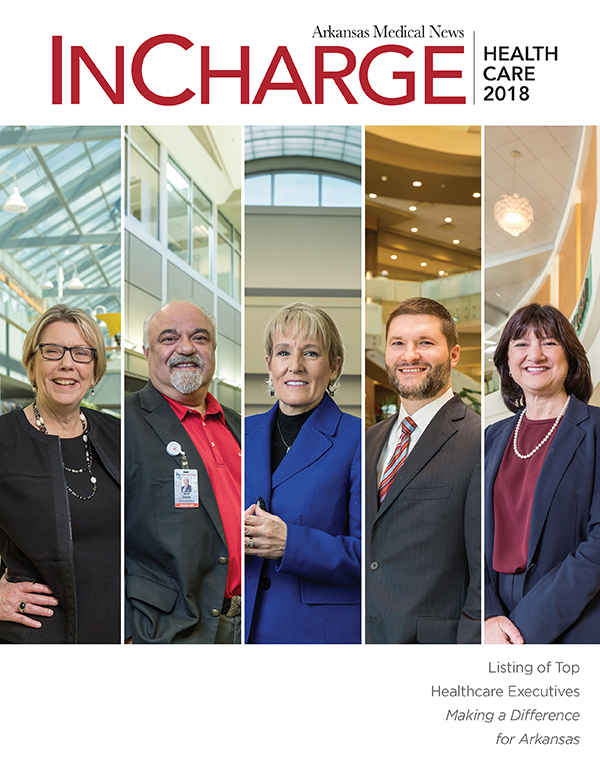 Hall is on the board of directors of the March of Dimes and the Ronald McDonald House at Arkansas Children's Hospital, which just finished a new expansion to help take care of families who live a long way from the hospital. Hall, 71, would like to focus the rest of his career on outreach. "We would like to concentrate on trying to improve the outcomes, particularly infant mortality, for babies in Arkansas," he said. "We have also reached out to Oklahoma and its Native American community to work with them to decrease infant mortality in their state, as well. One of the big areas where Arkansas and Oklahoma fall behind is in post neonatal infant mortality or death between 29 and 365 days. After the first month, deaths are primarily sleep related, which are mostly preventable." Every parent needs to know about the "Back to Sleep" initiative, putting the baby on his or her back to sleep, no co-bedding, using a firm mattress and not putting things like stuffed animals in bed with the baby. The baby should sleep in the same room as the mother, but not in the same bed. You can put a blanket on the baby, but Hall said a sleep sack is even better. He prefers that the baby just be dressed warmly and not have a blanket that might get caught over the nose. "That could be one of the predisposing factors to why children have premature death," Hall said. "The two other ways to prevent sudden unexpected infant death are not smoking around babies and breast feeding. If everybody did these things, we could lower the infant mortality in Arkansas by another 2 per 1,000 live births annually. That is a message to everyone. That is one of the things we really want to concentrate on." Hall himself is father to nine children, including four biological children and five adopted children. He and his wife, Lisa, now only have one more child still living at home. In his spare time, he tries to keep up with his kids. For hobbies, he likes to hunt, fish and do almost anything else outdoors.